The vice-President for Security and Political Sovereignty, Vladimir Padrino Lopez, is also the Defence Minister of Venezuela. 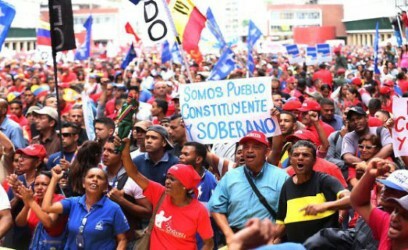 He has declared that the National Bolivarian Armed Forces (FANB) are tasked with presenting proposals for the reinforcement of the “Plan Patria 2019-2025”; and this, around the criterion of the deepening of Socialism, the only way to consolidate democracy in Venezuela. The Minister declared also that the concept of de-colonisation will have pride of place in the debates and proposals for the New Programme for the Nation. This will not fail to take account of imperial aggression and its impact on the peace and security of the citizens. Padrino Lopez said that these debates will continue within the Superior High Command of the FANB. He confirmed that a good level of morale is observable in all the country’s barracks, along with the combative capacity and good disposition of each operational unit to fulfil the tasks set out in the Constitution. Elsewhere, the leader of the Operational and Strategic Command of the FANB, Remigio Ceballos, recalled the cruel attacks that the Venezuelan people are having to suffer. He said that the country requires well prepared Armed Forces, and this more than ever. And that the National Constituent Assembly must plan for more judicial measures, to cope with all the types of menacing actions. 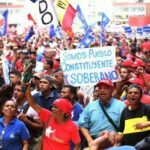 Agencia Venezolana de Noticias, 20.1.2018.